Pardon all the Old English, but this song, written by James MacDermid in 1908 is locked in my musical memory, and rises to my lips from time to time. It’s taken from David’s 91st Psalm. I couldn’t find a recent or updated recording but I love the words and the music. Over the last month I’ve made it into a prayer. Not just recited words, but words that have been hidden in my heart since voice lessons during college. When tempted to be fearful about my cancer diagnosis, and upcoming cancer surgery, and the possibility of treatments after that, I’ve asked God to keep me dwelling in His secret, protected, shadow, where He shields from danger. I’ve asked Him to be my refuge, my dwelling place, because close to Him, evil can’t touch me. His angels are all around me, guarding me from stumbling and tripping up in my fears. Many a night over the last month, with the constant knowledge that there is cancer in my body, and not knowing how much, I’ve whispered these prayers to the Lord as I drift off to sleep. Oh what comfort. All of this reassurance, and promise of protection, had more to do with my fears, than the cancer. More to keep me from evil temptations to doubt God’s goodness, or fall apart with anxiety, than the number of cancer cells, or the type. After all, I was trusting my Lord back in 2002 when He allowed me to have stage 3 cancer, (with a 50% chance of a 5 year survival) and the ensuing year of treatments. During that season He kept me close and gave me courage, and walked through the trial with me. Then with Gary's 9 year illness, we both knew the closeness of our Lord and were continually en-couraged by Him. Then for the last 60 days, He kept me close again and gave me courage, and eliminated the cancer with no further treatment needed. Someday I will likely get sick again, probably more than once, and He will comfort and strengthen me then too, until I finally enter His presence and see my savior face-to-face. We live in a fallen world, so there are repercussions, illness being just one of them. No one is exempt. I am grateful to God that we have incredible medical advancements, and I received GREAT care by my health care team, but as a Christian, I know everything is an opportunity to glorify God, so let me say PRAISE GOD today. Yes, for healing me quickly this time, but mostly for walking along with me, giving me comfort, and strength. Just a note: if you would like to have each blog post delivered to your email inbox as they are posted here, just put your email address into the box on this page that says "Follow By Email"
Like many of my fellow Americans, I don’t like to wait. I don’t like to generalize, but I’ve noticed that other cultures seem to be better at it than we are. If you’ve ever been in Hawaii, you know the "Aloha Spirit” which to the best of my understanding means there is more emphasis on relaxation and enjoying the moment, than getting somewhere “on time.” I think there’s a generational aspect to waiting with patience too. Best examples were my my mom and dad. 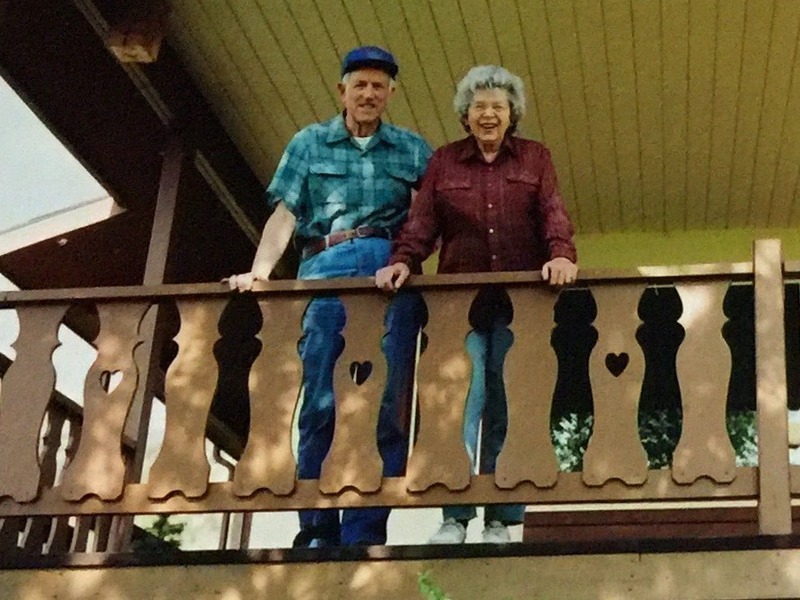 Maybe it was my parents’ personalities, but when they were waiting for a ride, or a phone call, or a package to arrive, they were able to enjoy chatting with others, or the activities going on around them. They made friends while waiting. It could be a fellow tourist waiting for Old Faithful to erupt, a fellow skier in the lift line, or someone waiting their turn at the barbershop. Technology is great and it allows me to text, call, leave a message, or go online and check anything I want, without waiting for someone to return the library book I was waiting for. I have communication (sort of), and information (sort of) at my fingertips. No wonder I try to find the shortest line, and try to get the earliest appointment at the Dr. I have the urge to “save time” not waste it, and have more “free time” to do what I want. But let me tell you, one of the hardest things to wait for is surgery when you know you have cancer in you and you want it OUT! It’s been several weeks since getting the news that I have a malignancy, and this is the week for the surgery to remove it and check the lymph nodes to see if it spread. I’ve been trying to make good use of the days, doing things that I won’t be able to do for a while and stocking up on comfort foods. There’s been a bunch of medical tests, and waiting rooms mixed into the last few weeks too…many hours spent driving to appointments and medical tests, and waiting to hear, “The Dr. will see you now.” I confess, it’s easy for my mind to slip into the frustrated wonder of “Why is it taking so long?” There’s the earthly plane, where crowded schedules get interrupted, emergencies happen, freeway exits are missed, computers are down, and people are forced to wait. But oh how thankful I am that even though I forget it sometimes, I am not “of this world.” Because Jesus Christ is my savior He has a very special, specific timetable for me because He has my ultimate good and joy in mind. He is in charge, (REALLY in charge) so I’m not ultimately waiting for someone to “call me back” or for someone to fax the right thing to the right place. God is the One I’m waiting for. That makes all the difference. Just remembering that God loves me, wastes nothing, and is committed to conforming me to the image of His son, takes off the pressure. During these “cancer’s-in-me” days, I’ve been enjoying His great comfort, and when tempted to impatience, I’ve been bolstered and loved. I won't know the outcome until my amazing medical team is done with me, but I'm really grateful for them, and no matter what, I hope to glorify with every day of my life. 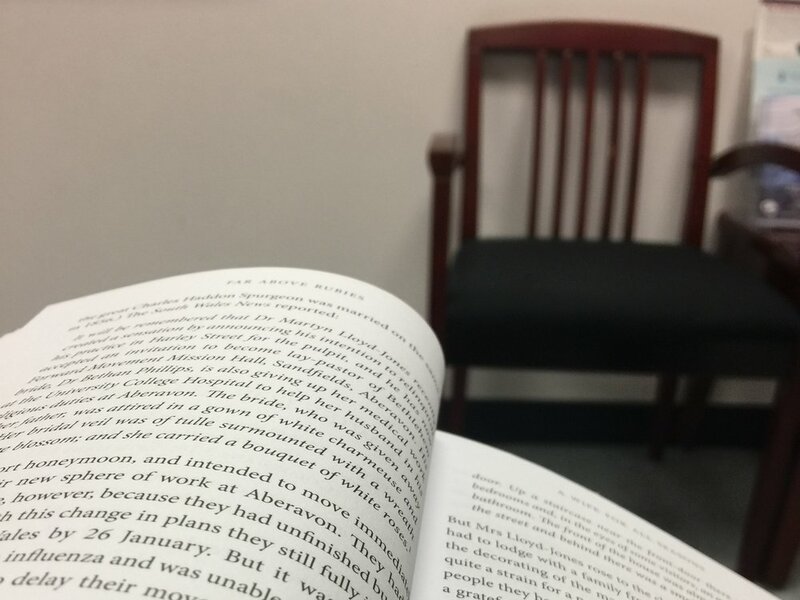 I'm sure I'll be in "God's waiting room" again at some point, and I'll look forward to what He has in store for me there. It is hard to describe the opposing feelings within me. Sadness and loss, are intensified, even though I've been saying "goodbye" to Gary for a long time. The hopes of him smiling at me, or saying a word, or noticing if I walk through the room, are over. But now there is something new. Feelings of joy and satisfaction, for Gary's new condition. He is finally "home" and I am so relieved and thrilled for him. There is a new happy freedom for me too, as I can come and go, without giving thought to arranging for caregivers or concerns for Gary's well being. He is fine now, "extremely fine," but I miss him. When his body was taken away, it was really hard for me. It was the form that his soul was housed in for nearly 65 years, and I loved the whole man. Inside and out. The finality of death added a new level of sadness to my life. It was just the shell he lived in, but I've been one flesh with him for 40 years, and that is over. "Widow" is a new title for me, but I'm Gary's widow, and he has shaped me. We shaped each other. God used us in each others' lives to cause growth. I'm forever grateful to him. In this odd little time between Gary's death and his Memorial Service, coming up on Saturday, I've been crying and laughing. I find myself habitually looking in our room to see how he is, feeling strange at the grocery store, when I don't need to pick up Gary's foods, and wishing he was here to talk to even though he couldn't respond. But preparing for Saturday, is new and different, and I'm loving going through the old photos and memories as I write his eulogy. It's such a neat way to receive comfort. After next week, I'm sure I will start to explore the "new normal," but for now, I'm doing ok, and enjoying the busy preparations. Thank you all who are so lovingly caring for our family during this time. My heart is empty and full and I'm ok with that. It's a favorite of mine...Psalm 25. In my Bible, it’s got underlines, and notes in the margin. I'm drawn back to it when I have decisions to make or am feeling overwhelmed. The first time in my life that Psalm 25 had a huge impact on me was 12 years ago, when I was fighting Stage III cancer. David’s prayer-song has been a comfort to me ever since. Many of you know my mom went to Heaven in July. We are adjusting to the “new normal” with her gone. My dad is lonely, in frail health, and though we enjoy being together, our short visits are limited since I can’t leave Gary alone. Being responsible for my dad's care, is a weighty thing. Over the last months my health has been threatened with headaches, weight gain and overall tiredness. My father broke his hip (now healed). My mother died. Gary has lost more weight, is now unable to walk and is confined to bed. He no longer seems to recognize me or others. A recipe for depression? Yes, BUT then God ministers to my heart . God will NOT let His own be "put to shame." In Hebrew, that means disappointed, delayed or confused. Now…let me walk through this precious Psalm and share my heart as I go…Ok? You’ve got my soul Lord. All of my inmost parts. Again I give myself to You. You have my attention. Nothing is beyond your concern, care and plans. You are large and in charge. 2 O my God, in You I trust, You are worthy of my trust! Don’t let me be delayed…Help me to pace my emotions & energy knowing that Your timing is perfect. Don’t let me be disappointed…Let me see glimpses of the wonderful things going on in the midst of things not turning out the way I expected. Don’t let me be confused…Give me clarity in the face of much information and many opinions. Do not let my enemies (the enemies of my soul…Satan and his demons) exult over me. Don’t let them have the last laugh by discouraging me. Those who deal treacherously without cause will be put to shame. I want to do what you would do, Lord. Let your love and wisdom flow through me. Keep me always learning from your Word because You are the One who saved me. I'm eagerly looking to You for direction and help for the two frail men I love. Show Your compassion to Gary and my dad. Be merciful to us. Lord, You are using the pressures and stresses of these days to reveal sin, lying beneath the surface in my heart. You are good to do so. Please forgive my impatience, and pride. You are SO GOOD, to point me in the right direction. I’m incapable, inadequate, often wrong, and proud. Keep me humble in order that I can follow Your lead. ALL the paths…I’m so encouraged and comforted by this promise that everything You do, is merciful and true. There is no unkindness or deception with You God. Your ways are good, even these current difficult days. Because of who You are, You forgive. 12 Who is the man who fears the Lord? He will instruct him in the way he should choose. His soul will abide in prosperity, And his descendants will inherit the land. And more...Intimate relationship with the Lord and promises KEPT. I want to keep looking to God for everything because he’s going to rescue me from temptation. God, give Your grace to our family as we experience loss and suffering. It is hard to see my dad and my husband like this. My problems seem big to me but to you they are not. Save me from MY actual distresses, and from "feeling" distressed. Give your attention to the problems I’m facing. Forgive those sins of worry, doubt, and trying to do things in MY strength. Deal with the unseen but very real enemies of my soul, for I know they want to discourage me and wear me down. Keep my soul safe as you bring me all the way to Heaven one day and don’t let me be disappointed, delayed or confused, because I’m going to hide in your protective love. Build integrity and righteousness into my life and let them keep me strong and protected because I’m choosing to wait on You. You are the ONLY answer to the troubles of this life. We look to You eagerly anticipating our marching orders and asking for Your help every day. Help my resolve when I am weak. This week I did something I have never done before. I took myself on a mini-retreat in search of a breath of fresh air, time to think, remember, create, and rest. Everyone is busy, not just caregivers, but there is a daily weariness that I experience that is hard to explain. The idea of leaving Gary for a couple of days, was not appealing until recently. A couple of years ago, he would have been confused about my absence, but now he is unaware of the passing of time, or who it is that is caring for him. Things have been much harder in 2014 and my attention is diverted in many directions in addition to the sad decline in Gary. So, for several weeks I've been planning to take a couple of days off, and let the Lord take care of me. I packed a good book, my watercolors, and my Bible. Sunday morning, Gary's caregivers arrived and I said good-bye. It began with a beautiful drive. I enjoy driving when there is no traffic, beautiful vistas and Keith Green's music playing. Two of my favorite's are The Prodigal Suite, and Stained Glass. I was surprised how many times I was reminded of former times, and in a way, Gary came along with me. We were dating when we first heard Keith Green at Calvary Chapel in Costa Mesa. His worship music was a big part of our early years, and still is. I arrived at 3:00 at Moonstone Beach in Cambria on the Central Coast. Gary and I have stayed in several different hotels here, but The Fogcatcher Inn is our favorite. My adventures began with a brisk walk along the boardwalk along the bluff. It was quite windy, and cool, but very refreshing. How often I had walked hand in hand with Gary on the same boards. But this time I was alone and it was ok. I took tons of photos. Tried some "selfies," and shot scenes for painting reference and of course capturing the views to help my own memories. I walked along the beach too, scoping out a good location to paint the next day, and found a 3 pebbles to save. Each time we went to Moonstone Beach, Gary and I would gather "theme" pebbles. One year he'd look for jelly bean shapes and colors. Another, it was all white, or all green or all brown. They sit in jars in our sun room. I must confess, it's not as fun gathering them, without someone to show your special "find" to. Back at the room, I worked on a sketch for the beach painting to be done the next day. It is an amazing thing to have uninterrupted time. Throughout my retreat, I kept thinking, "What? It's ONLY 5:00?" instead of the typical "What? It's 5:00 ALREADY?" Here's a preview of the scene I was planning to paint "plein air" (outdoors). At dinner time I got a Tri-tip Sandwich to go at the Main Street Grill in Cambria and brought it to my room and saved half for lunch the next day. 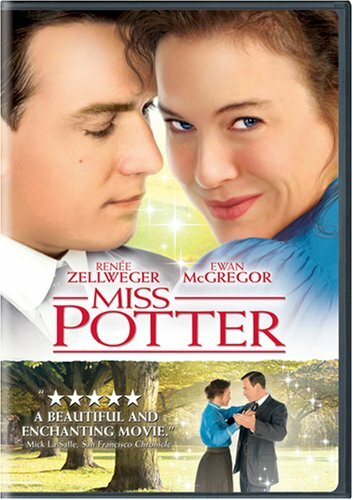 The evening's entertainment was the film, "Miss Potter" about Beatrix Potter starring Rene Zellweger. I've seen it before, but somehow it seemed fitting for this occasion. One of her comments as she was anticipating the publishing of her Peter Rabbit book was "We shall look upon it as an 'adventure'. It is a very sweet story, and I related on many levels; especially her love of watercolors, and the outdoors and her losses. One of the reasons we love the Fogcatcher is the complementary breakfast! It is not just danish rolls, mind you, it is the real deal, complete with sausage, eggs, waffles, and pastries. Peets coffee and a tray to take it to your room if you want. Now, about the room...Cozy, and facing the ocean, the view from here was better than the nicest restaurant. I had brought along "The Glory of Heaven" by our pastor, John MacArthur because I decided to focus my thoughts on Heaven this week. I want to think about Gary's future (and mine). A couple of thoughts on this...Since, as Christians, our "citizenship is in Heaven," (Phil. 3;20), we already belong there. It's where we are going one day and we can benefit partially now, from all the bounty of Heaven. Something else...To be "absent from the body is to be at home with the Lord!" So when we're in our earthly bodies, we are not at home with the Lord. We are walking by faith not by sight. One day, Gary will shut his eyes for the last time, and when he passes into eternal life, he will walk by sight, not by faith. His faith will become sight! I spent the rest of the morning painting the view out my window. I'm only including one tree because I'm allowed to do it however I want! :) Here's the start of it. The afternoon was spent browsing the gift shops and galleries in town. This might seem odd, but it reminded me of Gary too. He enjoyed looking in all the "cute little shops" as he called them. We never came to the Central Coast without coming home with a new plant from a local nursery. One favorite place in town, is an old house, complete with gardens in back, and each room in the house is a showroom. The mud room is for gardening related gifts, and the kitchen is where they sell herbs, essential oils, and potpourri. Out back there is a 'fairy' garden with cute displays. This is where we first saw a Newport Fairy Rose bush. It is an aggressive rose, and gets really big. Gary bought one 15 years ago, at the same shoppe and planted it by out arbor out back. in no time it covered the big arbor and was beautiful. It was one of the things I hated to leave when we moved. Seeing it again, made me miss Gary. In the late afternoon, the lighting was just right and the tide was low enough to go back and paint the outdoor scene. I got set up in just the right spot, on the sand, and began the fun challenge of capturing the beauty and feeling of the place, while keeping up a pace to beat the encroaching waves and mist as the wind began to pick up. I suppose I was out there for 90 minutes before snapping a couple more photos and calling it quits, planning to finish it up later. The day ended with another long walk and a good dinner. This time, Asian Chicken Salad. Breakfast. Reading about Heaven. Prayer. Painting. Frequently I would start to think of doing something...such as going for a coffee refill and ask myself "Will Gary be ok if I go downstairs and get the coffee?" "Oh, yea, he's not here. Go ahead and get the coffee." It's a big adjustment being 'on my own.' One thing caught me really off guard and hit me hard. I decided to wash the windows before heading out. As I did, it reminded me how Gary loved to do that whenever we were getting ready to travel. He took great pride in getting them streak free. Silly, what makes you get emotional, but I really missed him right then, washing my car windows in the hotel parking lot. I stopped for one last long look at the ocean at the south end of the beach on my way out, and had a snack there. I decided that I would like to do this again, maybe next year. It would be nice to look forward to. I was able to go to the same places Gary and I shared together, and enjoy myself. It was a happy/sad time, but I know he would want me to be doing these things and that makes me feel bold about venturing out a little. Driving home, normal anticipation of being with my love again was clouded by the knowledge that he wouldn't be able to participate in my joy. But in a weird way he does. We are 'one flesh.' My joy or sadness is his, and his is mine. On the way home, I stopped for a late lunch in Solvang, which was OUR first stop on our honeymoon road trip 39 1/2 years ago. I was facing more memories, and again, It was ok. When I got home and greeted Gary I wish I could say he responded but he didn't. I told him all about my time, away and maybe he caught some of it, but I couldn't tell. I put the 3 pebbles in his hand, and helped him hold them for a minute. Hopefully it brought back a good feeling for him like it did for me. I want to remember the "old" Gary. One of my greatest fears is that when Gary is gone to Heaven, is that I won’t remember how he was in the past. His strong body is wasted away, and there isn’t much left. He looks so different. His muscle wasting has revealed his skeleton, covered only by his skin. His skin is easily bruised, especially on his fore arms where the slightest bump can cause a minor skin tear. His remaining muscles can barely support his own weight and only with two helpers. Shaving is difficult because his cheeks are so sunken. His eyes no longer twinkle with an unspoken private joke. They usually look right past me. His voice is unused. His attempts at speech are lip movement only. His mouth is open all the time, causing his saliva to thicken and his mouth to get dry. Stealing a kiss on Valentines Day. Three months ago. He's lost more weight since then. Gary is comfortable and content. Except for meals, he is asleep. His Dr. said that most people with Alzheimer’s at this stage are no longer eating. Because he is a young Alzheimer’s victim, who had a strong body to start with he is doing better than most. Most of his energy is going to digestion, organ support, and the disease itself, and so he is very, very sleepy all day. He sleeps in the recliner from 9:00-2:00 and then back to bed for the rest of the day. Swallowing is getting more challenging so food has to be just the right consistency for him. Many meals are only partially eaten because he falls asleep. It seems the final decline may be right around the corner. Sometimes I want to scream at the disease…“STOP THIS!” It feels like a powerful train engine, slowly moving forward. My attempts at jumping in front of it to try to hold it back would be useless. Instead I am trying to make it a pleasant ride down the tracks for both of us. I play his favorite hymns, swab his dry mouth with cool water, and remind him of the past with a familiar touch and voice. I try to take care of myself too, with nourishment for my mind, soul and body. One of the reasons I write a blog and post old photos are to help my heart remember. I saved a recording of Gary’s voice on a voice mail message several years ago. I play it when I want to hear him talking. I want to remember these Alzheimer's years too. Dear friends who are moving away this month came to say 'goodbye' to Gary and I.
I don’t want to forget the sights and sounds of this hard journey. It’s all part of the bond and love in marriage, and joy of serving Christ together. We are on our way to Heaven, both of us. This world is not our home. We’re just passing through mortality and one day will put on immortality. Every part of this life is valuable and worthy to be remembered because the past, present, and future are all connected. I don't want to "discount" the last few years as wasted. 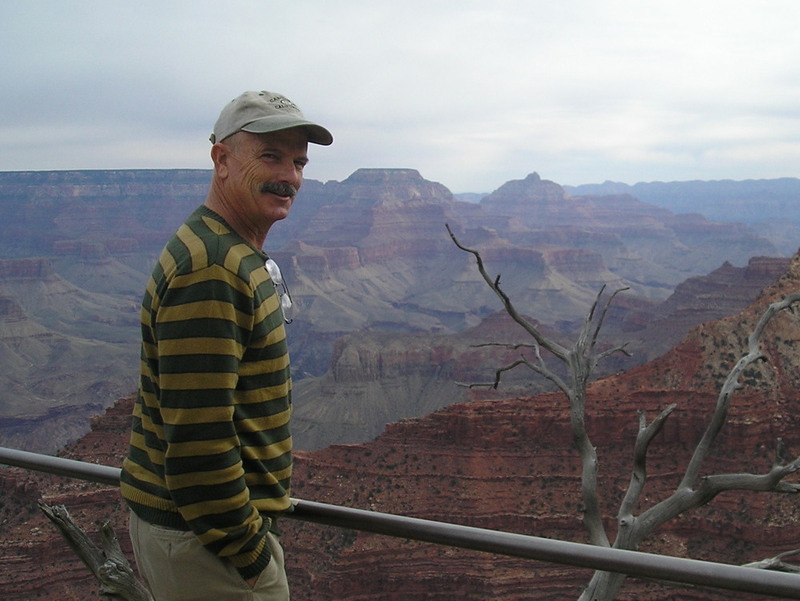 I have the privilege of assisting my beloved Gary along his difficult way. Along the way I get to observe some of the amazing things God is doing in our lives. "But having the same spirit of faith, according to what is written, 'I believed, therefore I spoke,' we also believe, therefore we also speak, knowing that He who raised the Lord Jesus will raise us also with Jesus and will present us with you. For all things are for your sakes, so that the grace which is spreading to more and more people may cause the giving of thanks to abound to the glory of God. I want to look forward. It's not that hard to remember his past because it is tied to his present and future. Past - Gary's sense of humor directed at the important things in his life. Even thoughts of life and death, reflected in this favorite book of his. It's a collection of funny and serious epitaphs. Present - Now that he is nearing the end of his life, it seems appropriate to think about his life and the seriousness of eternal things. Future - One day he WILL be in eternity, as we all will. I can't imagine seeing this on a tombstone, but it's so poignant. Record yourself sharing your testimony so your family will have your voice and story to remember. We wish we done this with Gary. Ladies, nurture your relationship with your husband, and learn to follow his lead so you will be able to move confidently through a trial knowing what he'd want you to do. Don't waste the years in complaining about trivia. During a trial, no mater how small or large, hang on tenaciously to God, trusting Him, knowing that there are future blessings in store, as well as good surprises along the way. When I received the call, I knew several things needed to be done. My dad, frail himself, would need someone to stay with him for the rest of the day and overnight. Gary can’t stay alone either. It’s a blur to me now, but I DO remember spending time with my dad, comforting and praying with him, being on the phone for a couple of hours trying to line up care for my dad, and Gary, and locating mom’s purse which did not make it to the hospital from the doctor’s office. Just like the recent earthquake, the accompanying adrenaline rush and problem solving began. This makes me laugh. I saw this on a recent outing. Reminded me of my posture BEFORE the visits to my chiropractor, Dr. Sawyer in La Canada! He has really helped my neck pain! Let me quickly interject that Mom is out of the hospital, and happily back home after a few days of testing and resting. She is so precious to me. I am grateful that God is keeping her great big loving heart going. I don’t know for sure if my health issues ARE due to stress, but they certainly draw attention to my “full plate.” Doctors are telling me to manage stress, friends are really concerned and people I barely know are asking me if I’m feeling ok. (I must look tired or something.) So, I’ve been looking at how full my plate has been lately. What's on the plate? Increasing moments of sadness over Gary slipping away from me and the changes in his body. My dear parents relying on my advice and help. My artwork and the associated deadlines. The daily tasks of life. All while not feeling well. I am not trying to be a superhero. I’m just doing the “next thing” that needs to be done. Whether brushing Gary’s teeth, going for a MRI, shipping a greeting card order, or picking up a prescription for a loved one, we do what we need to. It’s our joy and privilege to help those we love, and keep things running smoothly. You know what this is like. New succulents for the patio. SAY NO - Accept that I can’t do everything I want to especially when I don’t feel good. I had to cancel our monthly ladies bible study group that meets at my house, to be moved elsewhere. Even though I "could" have hosted them, I needed to rest. SAY YES - to a change of pace. I’ve been sprucing up our little patio a little bit each week. It’s been a very nice diversion. EAT HEALTHY - Juicing anti-inflammatory vegies. (Recently learned that stress causes inflammation.) I’ve been enjoying a spinach, carrot, apple, ginger combo. The ginger makes it zippy but I like it. GO TO THE DOCTOR - I’m having different tests and treatments to get to the bottom of these headaches. So far, they are not abating, so will get a brain scan this week. Shortly after my last post on Friday, the 24th, something went haywire with the text. You may have missed it, or shared it, and so, now that it appears the problem is fixed, I'm reposting. The thing is, I had no other copy of it so I rewrote it. Since I am a bear of "very little brain" I'm sure this new rewritten post is slightly different than the first. Please don't feel the need to reread it, but I just wanted you to know. I've deleted the messed up post and this will replace it. I've saved the comments at the end of this post, and you may leave new ones if you wish at the end. This begins the 8th year of Gary's Alzheimer's Dementia. ONE PHRASE and ONE PHOTO from each year were selected to describe the progress as time marches along. For those who have asked recently how Gary is, this will get you up to speed. Please don't be sad about this. Illness and decay are part of the human condition and there is much to be gained by facing reality head-on. My comments on our journey are at the end. 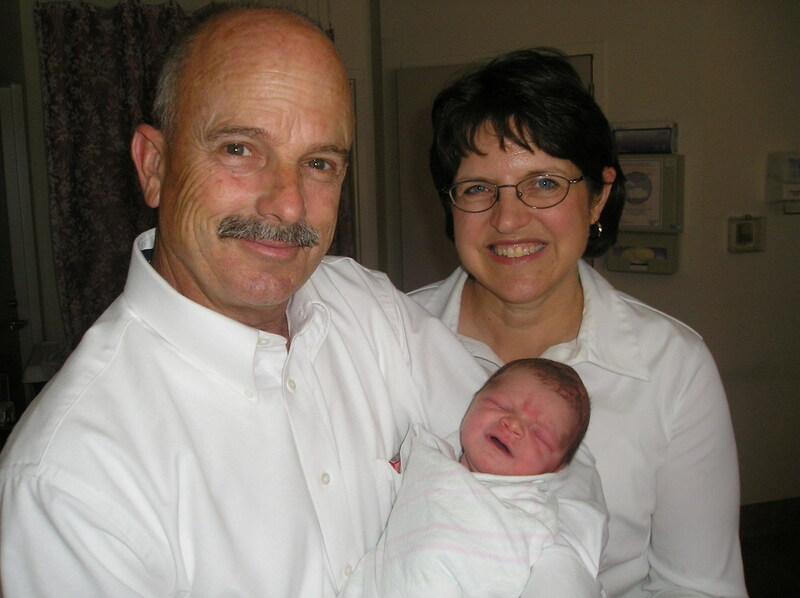 As we held our most recent grandchild at the time, we had no idea what was ahead. Gary and I both noticed little lapses in his short-term memory and slight confusion were gradually increasing. Even with missed appointments, slowed thinking and getting mixed up about things he should have known, it never occurred to us that there was something physical going on. We blamed it on his heavy workload. His face was less expressive as the year wore on. “I’m loosin’ it, Laurie!” he’d say. We began seeing doctors late in 2006 and after what seemed like an eternity of testing, Gary received the diagnosis, “You have an Alzheimer’s type dementia.” This was a scary time for both of us, but getting an answer was a relief of sorts and we spent much time in prayer together. In July, we closed our business, and Gary stopped driving. He bore it well. He prayed, "Help us be responsible, and draw favorable attention to what You're doing here." With Gary not working we were able to make lots of memories. We took day trips around town, Huntington Gardens, a trip to Florida to see our daughter’s family, and we even watched a missile launch at Vandenberg. We couldn’t be on the go every day of course, but Gary seemed to enjoy the activity. It gave him a sense of getting up and getting ready to work. He couldn’t stay alone anymore for his safety’s sake. During these months, he would occasionally forget who I was. He thought I had a “twin sister” or something. He kept a letter in his wallet that he wrote to himself, at the suggestion of, our pastor, Rick. In it, he had stated who he was, who I was, and our family members. (Someday, maybe I will write a post about this precious letter.) He would read it, when feeling unsure. It gave him his bearings and comfort. It became obvious that we needed to make a change in our living situation. Our home, yard and koi pond were too much for me to manage, since Gary was now incapable of maintaining them. Many friends and family members helped us get our home of 34 years ready to sell. Gary enjoyed seeing familiar faces and watching the projects going on around our house. We sold Gary’s truck and ski boat and started having garage sales and selling Electrical inventory and tools. He knew the truck was sold, but then forget, and get concerned when he couldn’t find it in the driveway and when he saw a white work truck, on the freeway, he’d say “I think I saw my truck.” He really, really missed his truck. In June we drove away from the home we lived in our entire marriage. Packing and moving day went really well, and Gary rode in the U-Haul with our son-in-law. It was a fairly easy transition for him. He never asked about going back to our old home but one time he said he missed the fish pond. We settled in to our new condo. It would be easier for me, and safer for Gary. He enjoyed the many walks around the neighborhood, stopping to pick up a twig or pull a weed in someone’s garden. We took more day trips and Gary ran errands with me enjoying the car rides. The change was stimulating for both of us, and yet Gary had some physical declines immediately after the move that never improved. He wandered off 2 times but both were within my sight and easily resolved. Our church began an Alzheimer’s support ministry in the fall which we have been part of ever since. As Gary’s world was needing to become simpler, my functionality was being challenged. The activity of busy grocery stores was becoming too much for him to handle. In Trader Joe’s he once said, “This is hard for me.” Neither could he safely stay alone, or sit in the car, or wait while I tried on clothes or went to the dentist. So for several hours a week, I engaged a care giver and/or he went to the Adult Day Health Care Center. This was all harder for me than him because I hated letting go, especially of his personal care. But Gary was cooperative and made another adjustment. We went to Florida to visit our family, where he enjoyed watching the grandchildren, but it was difficult in the airports and boarding planes. He still enjoyed working with a screwdriver, even if unconventionally, and manipulating “gadgets” such as nuts and bolts, or carabineers and pieces of rope. I began writing a blog about our life with Alzheimer’s. This year brought the end of the Adult Day Health Care. Gary needed too much help for the staff to provide, so we increased the home care. Gary’s occasional lack of balance resulted in a couple of tumbles and needed support when walking. We worked hard to retain the memories, by making memory books for him and playing family movies. Visits from old friends were met with a smile of recognition and sometimes a handshake. There were many outings this year with Gary’s wonderful new caregivers. He went to the mall, the lake, Vasquez Rocks, and the billiards room. By the end of the year a wheel chair was brought along in case he got too weak, or too imbalanced to walk. 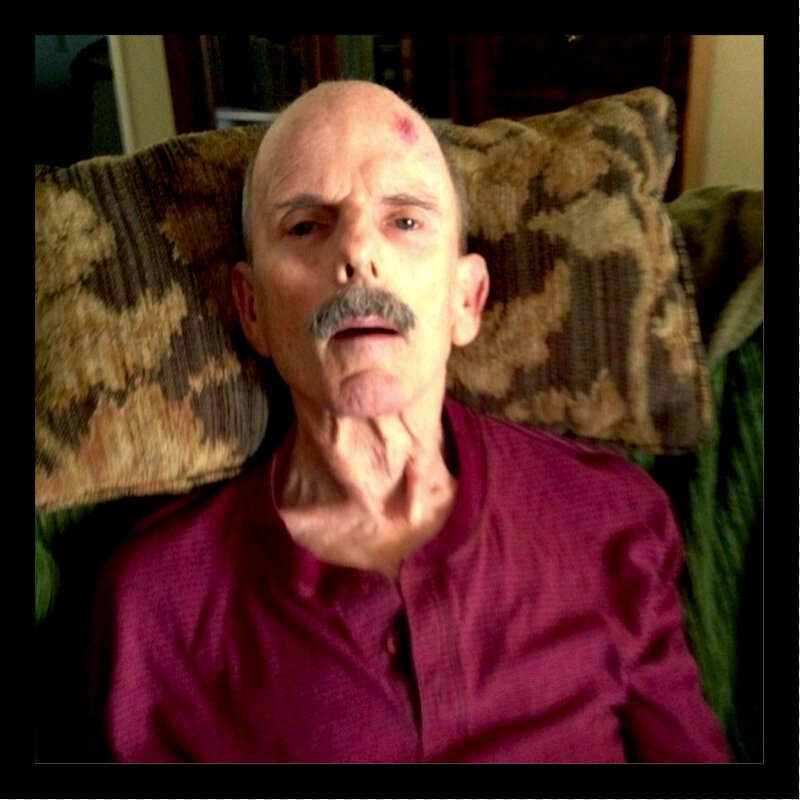 In the fall, we signed Gary up for Hospice and he has been receiving those benefits ever since. He has to be recertified every 2 months. Gary’s physical problems increased to the point where I needed MUCH help moving him around the house and helping him walk. We had a live-in caregiver for the first half of the year, and made many adaptations to our home to make things easier for both of us. There were a couple of outings in the Spring, but most of the year was spent at home. Gary became excessively sleepy spending most of the day in bed or a recliner. Meals took 45 minutes due falling asleep during the meal. Gary needed two people to help him go on a walk. I did more and more things without him. Family birthdays, church, etc., are too taxing for his tired body and mind. I don’t think I will ever get used to going to things alone while he is home with a caregiver. 2014 A rare moment with eyes open. I may not know when he is hurting or what he needs, but we try to treat him the way we would want to be treated and entrust his care and comfort to the Lord. Will there be a 9th, 10th, 11th? I don’t know. "Help us be responsible, and draw favorable attention to what You're doing here." If I can encourage you in any way, send a private message to me via the CONTACT tab at the top or leave a comment on this blog. Lori, it is amazing and obvious that God has chosen you and Gary to get help started in our church home for others walking this most difficult walk. I would love to have had help like this for my Mom and Dad. No one understands how much this disease affects not only the immediate family but old friends work cohorts, and others unless they know someone who has had to walk through it. I know you have been chosen because of your faith and strength and obedience to our Father but it is a heavy cross to bear... Gary's prayer is being answered and God is indeed faithful. Thank you. Thank you Jerri. I just got back from our monthly ministry meeting. One of the things we talked about was the idea, from 2 Corinthians 4 that "this momentary LIGHT affliction is producing and eternal WEIGHT of glory" It was so encouraging. I think as the baby boomers age, that this ministry will be all the more useful with so many folks coming down with Alzheimer's. As believers, God's ways are mysterious but good. He glorifies Himself and comforts at the same time! Thank you, Laurie, for sharing God's steadfast love and constant faithfulness. Knowing that He didn't spare his own Son from suffering, we can expect it. I'm grateful that His word has sustained and strengthened you both! Mick and I love you both and pray for you both. May 2014 be the year our Lord returns and brings [all] his sons [children] to glory. Loving Him along with you because He first loved us! Thank you for pointing us to Christ...even in suffering. Gary would LOVE for 2014 to be the year Jesus returns! Meanwhile, we pray for endurance and joy. Thank you for your sweet friendship and prayers. Thanks for this encouraging summary of your journey as a couple, Laurie! We are praying for you all. Love you too my dear! Say hi to the fam. I've been blessed to look back at your 8 years. My heart is amazed at the grace God has given you to care for your husband Laurie. Your commitment to him encourages me so much! God bless you... I mean REALLY bless you Laurie! I DO feel blessed. Thank you. I'm constantly amazed at all God has done. I'm sure you could share a zillion things too, from your own journey. Hope we get to meet one day. Thanks Lukas. God is faithful. I'm encouraged by your steadfast faith in the Lord Jesus, Laurie. We are praying God would bless you with more confidence in Him. Have you ever read a book called Spectacular Sins? It's by John Piper and it's free as a .pdf from their website. Thank you for your prayers. I'm assuming that "Spectacular Sins" refers to the curses on this earth, which include sickness and death, which are used by God, for our good, and to display His glory. Not to good with the roots, but guessing... "spectacle, or inspect, to see"?? Just wondering. Will have to check it out, because I like to read Piper. Thanks for the recommend. Yesterday we celebrated 39 years of marriage... Family came over. They showered us with flowers and cards. We ate Tri-tip and BBQ Chicken. Gary stayed in bed until everyone arrived at 5:00, so he'd be well rested for the evening and hopefully connect to the goings-on. On the special days...it's easy to give in to pity parties, wishing things were different, but making a new memory is great medicine for me on Birthdays, Anniversaries, Christmas. One thing I've learned over the last 7 years is that it is really important for ME to celebrate things REGARDLESS of Gary's ability to respond. If he IS taking in his surroundings, then that's even better. So, we had a party. Gary opened his eyes once or twice during dinner while he munched his Steak, and Garlic Potatoes, but for the most part, he remained non-communicative. Right after dinner we settled in by the TV so I could show everyone Gary's present from me. I made him a DVD with the audio of our wedding with photos. During the hours I spent putting together the video, editing the photos, and listening to the ceremony, I was surprised by the effect it had on me. I was so happy, listening to Gary repeating his vows. I miss hearing his voice now. I cried as I listened to the challenges laid out by our Pastor, to love unselfishly no matter what. I am faced with that choice every day. My heart was flooded with gratefulness for 39 years. Gary gave a gift to me last night too. Toward the end of the video, he opened his eyes and watched for a few minutes, and even made some sounds, trying to speak. Pastor Travaille prayed this poem for us. God has truly answered this prayer for Gary and I. Whom Thou forevermore doest join in one. With childlike trust that fears not pain nor death. Grant them the joy that brightens earthly sorrow. Grant them the peace that calms all earthly strife. Lots of people ask me "How do you do it?" "How do you stay joyful?" Let me say that there's nothing special about Gary and I. We made a promise to God, in 1974 in front of each other. We prayed for God's strength and blessing, and we meant it. We didn't know that I would get cancer, and then that Gary would get Alzheimer's, but we knew that no matter what, God would expect us to keep our vows. And you know what? He's the one that has made it happen. Gary and I are just sinners, saved by God's grace. My joy is not natural. It's from Jesus' love for me, and the fact that we are just passing through this life. Our marriage was grounded in that love. I posted the wedding DVD I made for Gary if you want to watch the photos and listen to the ceremony. Hopefully it will encourage you. The music sound is distorted, but you can hear Pastor T, and us just fine. It's 28 minutes long. At the end is a doodle type note Gary wrote me just for fun. Me and Snowflakes....we go way back. Badger Pass at Yosemite sometime around 1956. 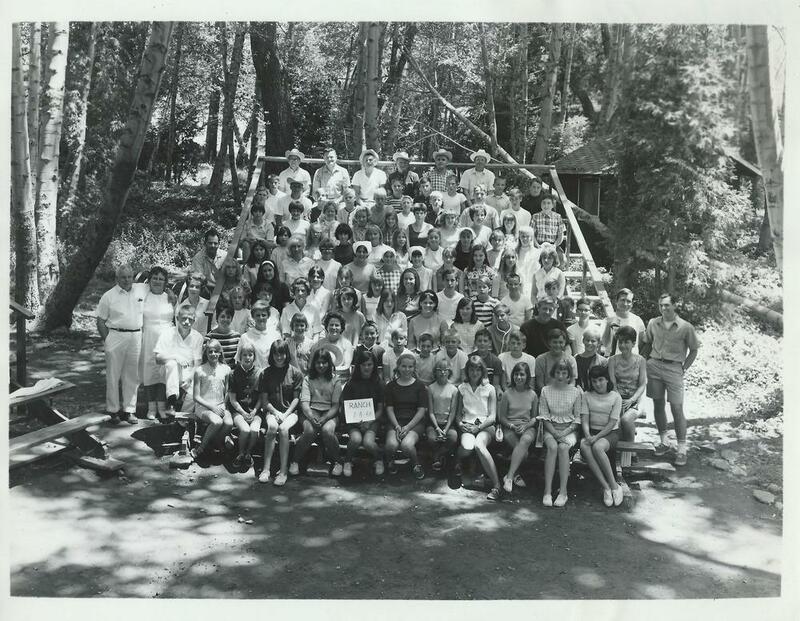 I still remember the big 3-D snowflakes on the front of the lodge. Here in Southern California the forecast for today is: 73 deg. Wishing we had a bit more of a typical winter here, I got to thinking about colder Christmases. My dad and I were recently reminiscing about the coldest skiing experience we could remember and we agreed that it was at Bridger Bowl, Montana. He was in his 80's at the time. We were riding the lift together and absolutely miserable. The wind was blowing right through our ski clothes. I don't remember my dad ever being cold. Growing up, he always tried to make my brother and I feel warm, and never complained about being cold himself. He used to let me put my hands on his coffee cup in the lodge to warm them up. One time when my brother and I were kids I remember crying as my toes thawed out at the end of a fun day of skiing. It was in Aspen, Colorado, and there were ice crystals in the air. It looked like glitter as I looked out the car window enjoying the heater. Even my painful toes didn't stop me from taking it in. I still remember how beautiful it was. 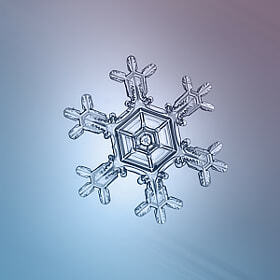 When snowflakes drift down and land on your jacket, they truly are beautiful. Only in the really cold, do they last very long once they land. I'm so glad I had the opportunity to see snow on the many ski trips we took. 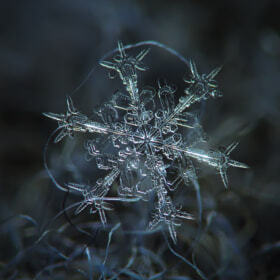 I gained a healthy respect for the cold too, and the powerful changes that come with winter. 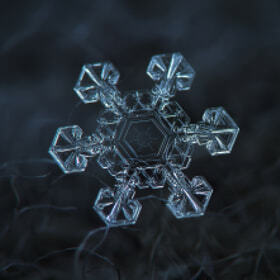 These amazing macro photos of snowflakes will blow your mind. These beautiful creations require very cold temps. In fact, the photographer has to work fast to capture them before they begin to melt. For centuries, it's not been possible to see the detail. How wonderful that now we can see the intricacies. I was reminded of the passage in Job describing God's powerful hand in the weather and seasonal changes. "God thunders with His voice wondrously, doing great things which we cannot comprehend. For to the snow He says, "Fall on the earth," and to the downpour and the rain, "Be strong." He seals the hand of every man, that all men may know His work." "Then the beast goes into its lair and remains in its den. Out of the south comes the storm, and out of the north the cold. From the breath of God ice is made, and the expanse of the waters is frozen, also with moisture He loads the thick clout; He disperses the cloud of his lightning." As you can see...Gary's had a few encounters with the little flakes too. Most of them had melted into his mustache and we always laughed at this picture. Though we'll never be snow-skiing again, we're still enjoying some big snowflakes that decorate our room in this crazy warm weather. I had no idea that one day I'd be using an old college art project as a memory aid for my husband, whom I hadn't even met when I created it. I hang these seasonal banners in our room to remind Gary what time of year it is so the "Winter" sign is temporarily pinned on. I never noticed it before today, but I think I must have been influenced by the blue snowflakes on the ski lodge as a little girl! 1972 College design project - 2 dimensional design for use in my home, constructed. This winter banner is one of four. Please know that Gary and I hope you have a wonderful Christmas celebrating the birth of our savior, Jesus Christ. From our house to yours, we send our love. Hello friends! Step across my welcome mat, and come on in to my new website! I've been sprucing things up with a new logo, a fresh layout, and I've been carefully placing the decor. I’ve wanted to have you over for a long time, but we’ve been under construction, and not ready for guests until NOW. If you have been visiting me on my blog, and now you’ve made your way here, you'll be glad to know I packed up my journal, “I Have Been Young,” and brought it with me to my cyber-home. There are so many blank pages yet to be written on, I can hardly wait to share more. I'm excited because moving in to my new website has allowed me to gather several areas of my life into one place, and since they are all related, I’m hoping you can settle in to a comfortable corner of my world and be enriched, encouraged or challenged in some way. As you can see, Colors By Laurie is the name of my new website (www.colorsbylaurie.com) and it's also the name of my watercolor business. As you may know, I love COLOR. (My “Welcome” page has the back-story on that.) Also, at the top of the page, the journal entries from my blog are now sorted into areas of interest (Art, Family, Alzheimer’s and Lessons) so you can easily choose a collection to browse. I’ve added links and resources that I’ve found personally helpful. You are a very special guest and my 'e-door' is always open to you. I hope you'll come back often, and invite your friends! through my artwork and writings. Friends, we live in the present moments! Alzheimer’s Disease is a good reminder of that. My husband may not remember the past, but he still feels the sun on his skin, hears the music and tastes the cinnamon roll. Being fully committed to “the present” and not worried about the future, or trying to “live in the past” is a lesson I am really trying to learn and will continue to share my heart with you. Of course, we remember the past. Memories can be vivid or faded, happy or sad, regretful or satisfying. Finding ways to enhance the happy memories, and learning from the others, move me forward to growth. I love finding creative ways to keep Gary connected to who he is through memories, and helping others preserve the beautiful and valuable moments from their lives with my artwork. I want to encourage all of us to enjoy the here and now, the memories and whatever is around the corner. Through my customized artwork, and journal writings, it is my sincere hope that your joy will be increased as well. I have a very special gift for one of you! There will be a drawing on Saturday March 23, 2013 at 6:00pm Pacific Standard Time for an 8" X 10" original watercolor painting! The winner will choose either a Personalized Monogram or an Architectural Portrait. The creation of the winner's painting will be featured on my blog for the rest of you as your consolation prize. Start to finish, a behind-the-scenes look at of one of my customized watercolors! Make note of your favorite painting. Enter drawing either of the following ways. Leave a comment at the end of this blog, and tell me which painting is your favorite. You can enter the drawing 2 different ways which gives you 2 chances to win! I'll add your name to the jar, post the winner on this blog AND my Colors By Laurie page next Saturday night (23rd). Please check back. I hope you enjoy looking around the rest of my new place for awhile. Click HOME or BLOG at the top of any page to go back and forth. Thanks for dropping by, and please come again! THE FIRST TIME YOU POST A COMMENT, YOU'LL BE TOLD YOU ARE NOT "LOGGED IN". ON THAT SCREEN YOU WILL SEE A PLACE TO CREATE AN ACCOUNT WHERE YOU'LL ENTER NAME, EMAIL, AND PASSWORD, THEN YOUR COMMENT WILL SHOW. I NEED TO KNOW WHO'S COMMENTING IN ORDER TO ENTER YOU IN THE DRAWING!